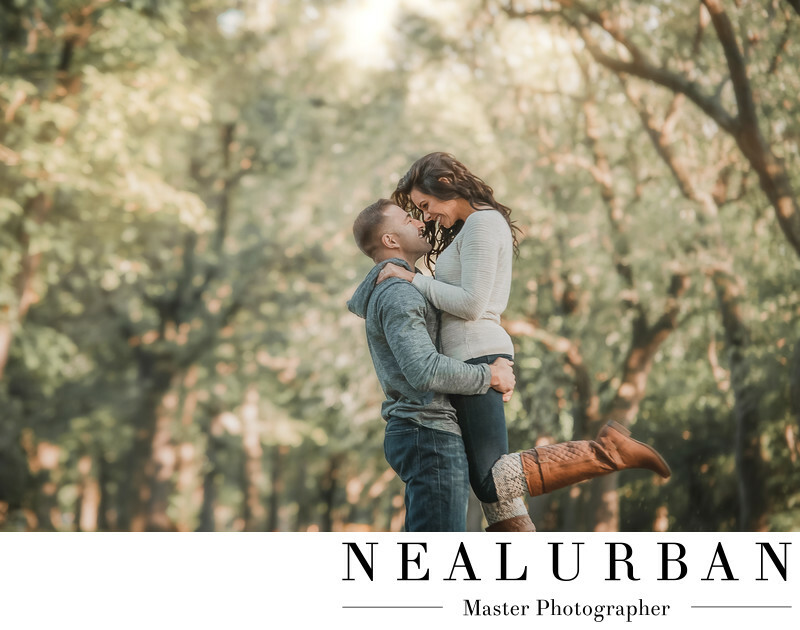 Nina and Vinny had a very pretty fall day for their engagement session at Fort Niagara State Park. We started their shoot inside of the Old Fort. They wore super dressy and classy outfits for that part. Then we went into the actual park for more casual photos. They had the best fall outfits for this part of the shoot. There is one part of the park that has a street lined with huge trees. They create a canopy. The sun light was making the trees on the street glow! We wanted to do something a little more fun with this couple. We had them stand in the middle of the road. Then Vinny picked up his fiance! We yelled out to Nina to kick up her leg! We did a series of these images. Some showed their entire bodies. This was closer up. We like the way the trees seemed to be brought in closer to them. The couple stood out a bit more too. We also really loved their expressions. With the image being further away, you could not see that! We always like to take different angles in a location. Most of the time, Neal is taking one angle and I am doing something completely different! That is why having two photographers, especially for the wedding day is great! And Neal and I shoot different style photos! On the big day, we went for photos at Shea's Performing Arts Center. Completely different style than the engagement session. It was gorgeous. Then to Antonio's Banquet and Conference Center for the reception. Location: 1 Scott St. Youngstown, NY Buffalo NY 14174.